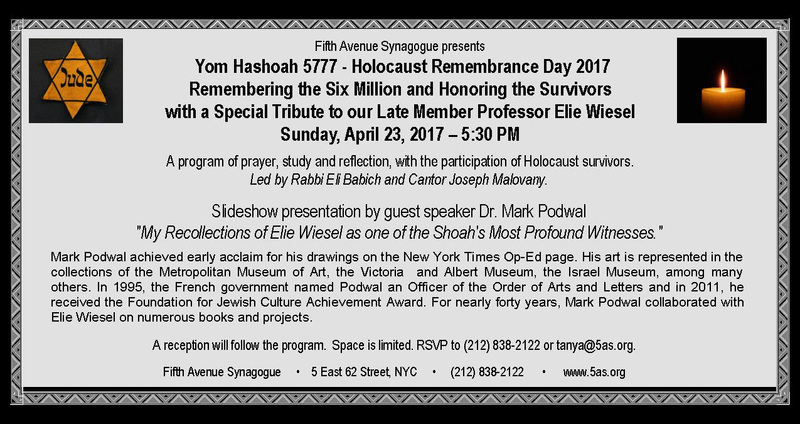 New York’s Fifth Avenue Synagogue presents Yom HaShoah 5777 – Holocaust Remembrance Day 2017 with a special tribute to their late member Professor Elie Wiesel. A program of prayer, study and reflection, with the participation of Holocaust survivors. Led by Rabbi Eli Babich and Cantor Joseph Malovany. Slide show presentation by guest speaker Dr. Mark Podwal “My Recollections of Elie Wiesel as one of the Shoah’s Most Profound Witnesses”. Mark Podwal achieved early acclaim for his drawings on the New York Times Op-Ed page. His art is represented in the Metropolitan Museum of Art, the Victoria and Albert Museum, the Israel Museum, among many others. In 1995 the French government named Podwal an Officer of the Order of Arts and Letters and in 2011 he received the Foundation of Jewish Culture Achievement Award. For nearly forty years Mark Podwal collaborated with Elie Wiesel on numerous books and projects. Fifth Avenue Synagogue, 5 East 62 Street, NYC.